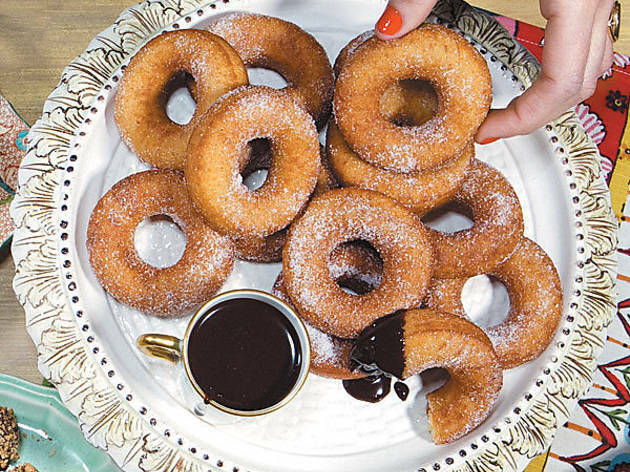 15 Chicago restaurants that serve doughnuts. Atwood Café (1 W Washington St, 312-368-1900) The doughnuts here are rolled in cinnamon and sugar, then covered in a root beer glaze and sprinkled with chunks of bacon. Atwood serves doughnuts with raspberry jam at brunch, and the bacon-root beer version at lunch and dinner. BellyQ (1400 W Randolph St, 312-563-1010) Since August of last year, BellyQ has been serving its Vietnamese cinnamon donuts with huckleberry jam and vanilla soft serve. The chefs make a Chinese-style bun (bao), fry it and then sprinkle the pastry with cinnamon. Served at lunch and dinner. The Bristol (2152 N Damen Ave, 773-862-5555) As the seasons change, so do the doughnuts at the Bristol. During the spring and summer, you can enjoy a freshly made strawberry and rhubarb doughnut. 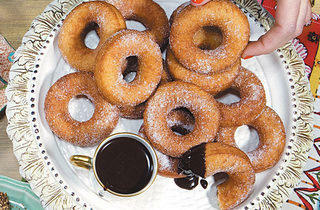 The fall and winter brings cinnamon and sugar doughnuts served with apple butter. Served during brunch only. David Burke’s Primehouse (616 N Rush St, 312-660-6000) The "Kickin’ Doughnuts" are served with three bottles of peach, caramel and vanilla cream fillings that you can "inject" into the doughnut. Served at brunch, lunch and dinner. Estate Ultra Bar (1177 N Elston Ave, 312-582-4777) The cinnamon sugar and Mexican chocolate doughnuts here are served with a chocolate espresso dipping sauce. Served during dinner. Filini (221 N Columbus Dr, 312-477-0234) During the winter, Filini serves its "Fired Doughnuts" with either cranberry jam, cider caramel or chocolate sauces. To fit the season, the sauces are currently strawberry, rhubarb and salted caramel. Served at lunch and dinner. Fork (4600 N Lincoln Ave, 773-751-1500) The housemade doughnut holes are made from yeast-risen dough, punched down, put in a cooler where they double in size and then fried. The preparation is seasonal: heartier glazed doughnuts during the cooler months and, during warm weather, lighter doughnuts coated with sugar and served with jam. Served at breakfast and lunch. Frontier (1072 N Milwaukee Ave, 773-772-4322) The powdered beingets here are served with a rum-apple sauce. The pastry is served only for Friday, Saturday and Sunday brunch. Gather (4539 N Lincoln Ave, 773-506-93000) After making a wide ring with live yeast, milk, butter and a little nutmeg, Gather deep-fries the dough and dips the doughnuts in a lemon glaze. Served on Sundays for brunch. Mindy’s Hot Chocolate(1747 N Damen Ave, 773-489-1747) The doughnuts here are made from brioche dough, fried to order and rolled in cinnamon and sugar. For breakfast, the pastry comes with a side of raspberry jam; during lunch and dinner, the squares are served with hot fudge and caramel corn. Nightwood (2119 S Halsted St, 312-526-3385) During brunch, you can always go to Nightwood and order a brioche-style doughnut with bacon butterscotch glaze. However, when the chefs have certain fruit and jams in their kitchen, like cherries, cashews, strawberries or chocolate, you can also find doughnuts glazed in those flavors. PI-zen (1519 W 18th St, 312-733-0248) The doughnut holes here are coated in brown sugar are served with a different dipping sauce everyday. Served at breakfast and dinner. Trenchermen (2039 W North Ave, 773-661-1540) The doughnuts here, made of fried brioche dough, are dipped in a whiskey-caramel glaze, though lemon and coconut glaze has been used previously. The brunch doughnuts are larger. At dinner, a smaller doughnut is served with vanilla-malt ice cream. Served at brunch and dinner. Two (1132 W Grand Ave, 312-624-8363) Two’s pretzel donuts have a chocolate center and cinnamon-sugar coating, and are served with chocolate dipping sauce. Served at dinner. Yusho (2853 N Kedzie Ave, 773-904-8558) A tofu doughnut: balls of cake flour soaked in tofu mix and fried to a golden brown. When plated, they're drizzled in milk chocolate, sprinkled with ginger and served with green tea and puffed rice. Served at dinner.